IDW, the 'little' major publisher that could, has an awesome array of titles on show this April. 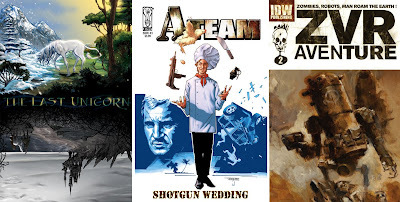 Three hits of their best covers include (left to right): RENAE DE LIZ - The Last Unicorn #1, JOHN K. SNYDER III - The A-Team: Shotgun Wedding #3, and ASHLEY WOOD - Zombies vs Robots Aventure #3. For full solicitation details visit Newsarama.